The national student debt now totals to a devastating $1.5 trillion—and women possess the majority of it. Like most issues, the debt crisis is more complex at the intersections: Black women are taking on the most debt, and for longer periods of time. 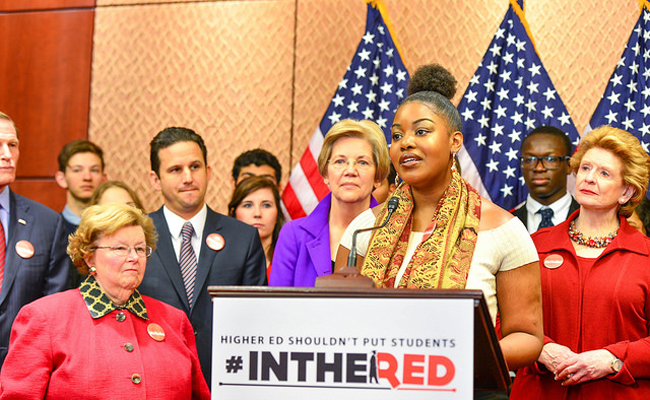 Because of a sizable and racialized gender pay gap and inequities in the average cost of education among women of color, Black women are spending more for their education, and they’re paid less when they graduate, which creates specific barriers to repaying student debt and inhibits the decisions they can make around their futures. The disproportionate burden of student debt facing Black women is also creating a crisis for our economy. The statistics on Black women’s incredible spending power feels like a stark contrast to our distinct debt crisis. In one four-day weekend alone, I bore witness as Black women reportedly drove millions into the local New Orleans economy for the 2018 Essence Festival; a 2017 report by The Nielsen Company named Black women as key influencers of mainstream culture, and added that the use of their social media platforms help to determine product successes in the economy. The same year that Nielsen’s report was released, BuzzFeed shared the financial and emotional effects of student debt in the life of a Black woman identified as Brittany—a Tufts University alumna who pays $900 a month toward her student debt but barely chips away at her principle balance in the process. What struck me in Brittany’s story was the high interest rates attached to her loans; because of them, she’ll be paying interest on what she’s borrowed for an extended period of time. This gap between spending power and desperate debt is proof of the ways in which capitalism relies on economic power imbalance to thrive, and it spells out serious consequences for the women supposedly at the helm of the economy. I’m concerned, longitudinally-speaking, about the ability of Black women to invest in themselves, about their self-deamination and about how debt and the race and gender pay gap can combine to sustain generational inequities. Like most millennials of color, I was told that student debt is something most successful people carry, and that I shouldn’t allow the cost of a great education to stand in the way of getting a college degree. But I belatedly realized this was horrible advice by the time I finished my out-of-state college experience. Despite my academic accomplishments and scholarships, I racked-up debt, largely for out-of-state fees, and after only a few years post-undergrad, it has already impacted not only my day-to-day life post-graduation, but my plans for the future. My debt was a catalyst for downsizing, saving and keeping my phone on do-not-disturb—but it also inspired me to better understand the nuances in Black women’s relationship to the economy that are created and furthered by women in my economic circumstances. We need to develop a larger discourse around women’s economic conditions that encourages us to consider what experiences exist for Black women and other communities who possess both major economic power and staggering debt. Part of that discourse must be considering the economic and social benefits of a student-debt-free society. Debt should not feel like a penalty for an education. The Levy Economics Institute of Bard College found in a macroeconomic study on the impact of debt cancellation that the economy would experience an annual average boost of $86 billion to $108 billion over the course of 10 years, with modest inflation, if all student debt was cancelled. The economy would benefit—and so would Black women, who would have greater ability to invest in themselves and in the market and see a major obstacle removed from their self-determination and futures. And yet there are many oblivious white people who still think it is the same marathon we're all running.